Teen apparel retailer rue21 recently announced its intention to be acquired by Apax Partners in a buyout valued at $1.1 billion, or $42 a share. Apax already owns 30% of rue21, but the announcement delighted investors and the stock shot up nearly 23% to just under the target acquisition price. CEO Bob Fisch noted in a press release that the transaction would allow the company to expand its footprint to over 1,700 stores and focus on achieving long-term objectives, including successfully implementing e-commerce initiatives and rueMan, a new brand of accessories, watches, and jewelry. rue21 currently has about 1,000 stores nationally, and competes with American Eagle Outfitters and Abercrombie & Fitch in apparel, and in the accessories category. RUE Inventories data by YCharts. In the past, my research has incorporated a Motley Fool Earnings Quality (EQ) Score that taps into a database that ranks individual stocks. The database designates an A through F weekly ranking, based on price, cash flow, revenue, and relative strength, among other things. Stocks with poor earnings quality tend to underperform, so we look for trends that might predict future outcomes. In terms of earnings quality, rue21 is in the middle of the pack at a C. Revenue is growing adequately, and inventories are generally under control -- one of any retailer's more important metrics to consider. 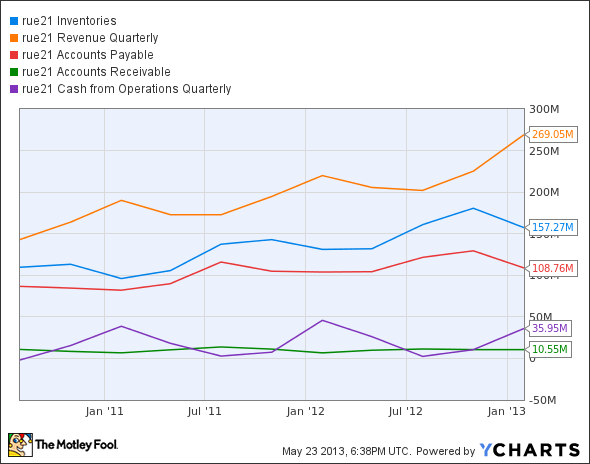 Not adequately displayed by the chart, however, is that inventory values have been growing slightly faster than revenue growth. rue21's receivables are under control. However, days payable outstanding have averaged 77 days over the previous four quarters, and payables as a percentage of revenue have averaged 52%. Operating cash flow has averaged just under $19 million per quarter for the last eight quarters, but the OCF margin has narrowed from 11% to 8% of revenue. Rue21's sales equaled $901.89 million and EBITDA totaled $101.42 million for the past four quarters, so the $1.1 billion deal works out to be 1.22 times sales and 10.8 times EBITDA for the 70% of the company that Apex does not currently own. Investors should take the deal. American Eagle Outfitters got its wings clipped after hatching some lackluster quarterly results during the week. Year-over-year revenue was down 4% to $679.5 million, and EPS flew the coop at only $0.14, down 38% from last year's number. The MF EQ database ranked American Eagle as a solid A stock, but keep in mind this factors in long-term trends -- and one quarter does not a trend make. Let's face it, the company had a bad quarter, but as with many retailers, seasonality comes into play. Operating cash flow was negative, but has been negative in past years during this quarter. Days in inventory is trending down year over year, which is good news, and inventory levels are also lighter than in previous years both in terms of value and as a percentage of revenue. Receivables and payables are both well managed. The stock has begun to move up since mid-April, consistent with past seasonal trends. Expect another quarter of wing-flapping, then a take-off to greater heights. On Friday, May 24, the company reported fiscal-year first quarter earnings of negative $0.09 a share and a net loss of $7.2 million. CEO Mike Jeffries noted that although the negative earnings number reflected a $0.16 improvement over last year, the results were caused by "significant inventory shortage issues." He added that with the inventory headwinds behind them, he expected to see continued sequential improvement in the second quarter. Nonetheless, the Street punished this retailer and the stock dropped 8.5%. The MF EQ database ranks A&F a B" but the rating has oscillated between B and A for several weeks. While it is true that lower inventory can translate into lower sales (not enough merchandise to sell), generally the opposite is true -- lower inventory should indicate higher revenue. In this case, however, sales were lower sequentially and year over year. A&F claimed improvement to its gross margin of 720 basis points, meaning the cost of goods sold was lower as a percentage of revenue. Inventory is the largest component of COGS. So, it appears that sales were sacrificed to improve the gross margin and earnings numbers. Tricky! Who buys clothes for the summary, anyway? Also, keep in mind that this quarter as well as the next are seasonally slow periods, so this could be an opportunity to put a toe into the water before the back-to-school and Christmas selling seasons kick in. Retailers are a good way to judge the state of the economy, but seasonality affects trading decisions. Patience is a key virtue here. As always, Foolish readers should base investment decisions on earnings quality. The article Will Investors Rue the Loss of Rue21? originally appeared on Fool.com. Fool contributor John Del Vecchio is manager of the Forensic Accounting ETF. He is the co-author with The Motley Fool's Tom Jacobs of What's Behind the Numbers? How to Expose Financial Chicanery and Avoid Huge Losses in Your Portfolio. He has no position in any stocks mentioned. The Motley Fool has no position in any of the stocks mentioned. Try any of our Foolish newsletter services free for 30 days. We Fools may not all hold the same opinions, but we all believe that considering a diverse range of insights makes us better investors. The Motley Fool has a disclosure policy.